Vieather is a free and simple weather app, available for both Windows Phone 7.5 and Windows Phone 8, that has a look and feel that is very much in line with the principles of Modern UI. It stands out from other free weather apps by virtue of its customisable Live Tile, which provides glance-able information on both current and upcoming weather conditions. 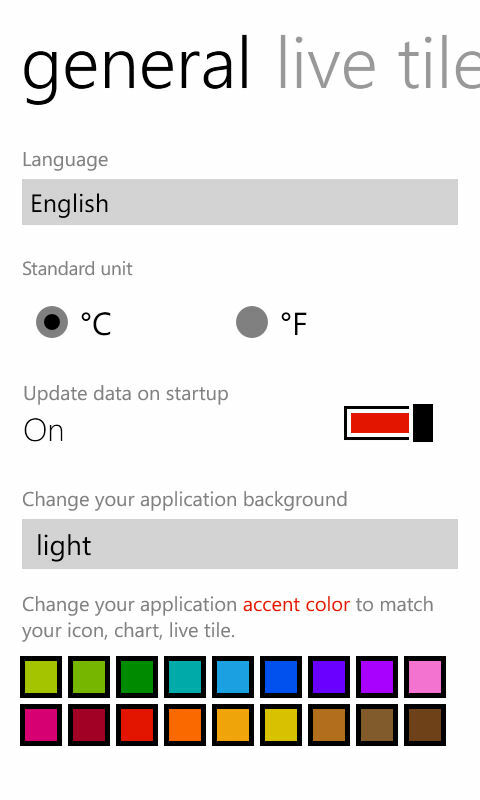 The app, having originally been released at the end of April, is a relatively recent addition to the line up of weather apps available for Windows Phone, but has already received a number of updated, the latest of which added support for more accent colours. This should hold particular appeal to those that like to have a mono-colour homescreen (i.e. 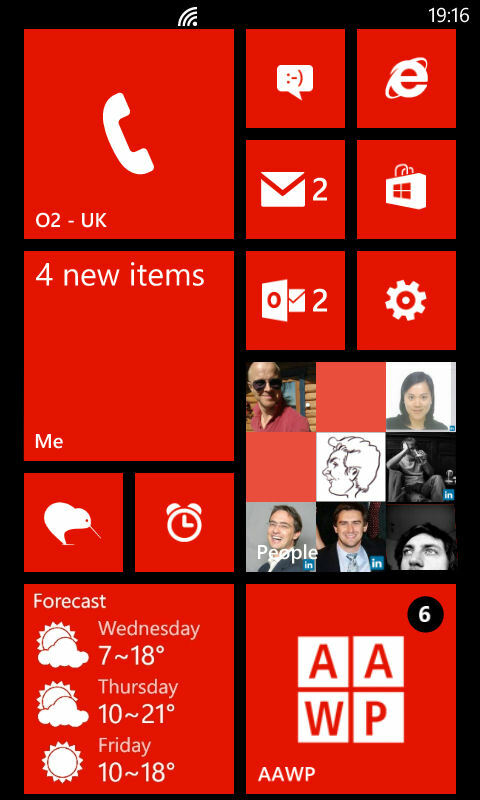 all the Live Tiles using the user specified accent colour). Vieather present a relatively simple set of current weather information (temperature, conditions, humidity, wind, and UV index), and the same is true for the forecast information (temperature, conditions, chance of rain, and wind). Continuing this ethos of simplicity the displayed forecast information within the app concentrates on the current day (hourly forecasts for the next six hours), but the app's Live Tile will show a forecast for the current day and the next two days. The advantage of this is that the app feels less overwhelming that some of the feature heavy alternatives available for Windows Phone, and there's a lot to be said for presenting the right amount of information in each context (app and Live Tile). If you're looking to keep things simple, then Vieather may be the weather app for you. Somewhat unusually the app lets you specify an accent colour separate from the system-wide accent colour. The advantage of this is that you can choose to have a weather app (and Live Tile) that stands out from the crowd (e.g. pink against a default blue), but we imagine most users will opt to match their system wide accent colour in order to obtain a clean looking Start Screen. 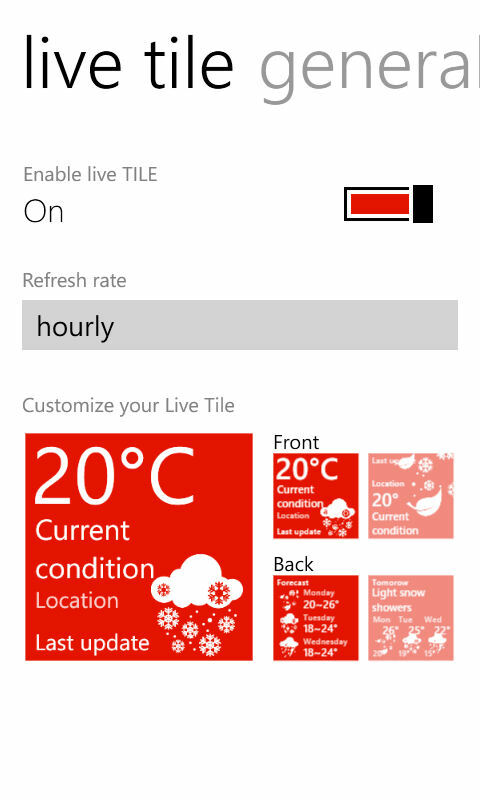 Both the front and back of the tile can be customised, with a choice between two options, each of which highlight a different aspect of current or upcoming weather information (e.g. on the back of the Live Tile you can opt for a detailed summary forecast for the next three days, or an extended summary for the next day and a brief summary for the following two days). Vieather does have a few issues that are worth noting. The quality of the forecast data is somewhat limited, as is the place database used to power the location search. However, given that high quality forecast data costs money, that's not enitrely unexpected in a free app. 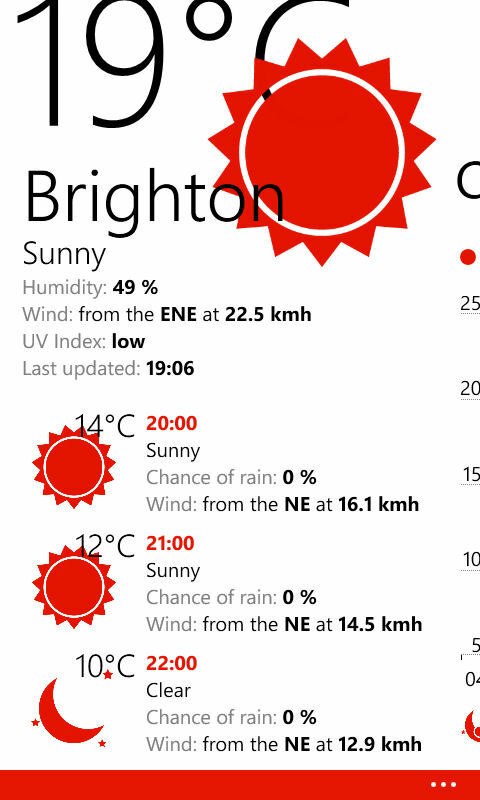 Moreover, given the price point, the forecast information is likely to meet many users "good enough" threshold, especially when combined with the ability to customise the app's Live Tile. Weather Live application at vary of provinces and cities in all over the world with Modern UI design. The data province are from The Weather Channel - one of the largest weather website. Vieather is a free download from the Windows Phone Store.